Youngsters from five Swansea schools have been praised for their contribution to promoting peace and tolerance. Clase Primary School, St Joseph’s Cathedral Infants School, Hafod Primary School, St Helen’s Primary School and the Step Ahead Education Centre in Cockett all received recognition in the annual Peace Mala awards in Cardiff. Peace Mala organisation was launched in 2002 and aims to educate children to become global citizens through the promotion of respect, friendship, tolerance and peace between all communities and faiths. Singer Bonnie Tyler, who has been a supporter of Peace Mala for many years, was on hand to distribute the awards on the day. 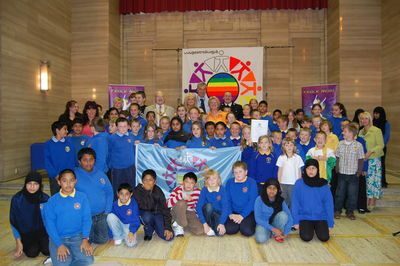 Hafod Primary School and St Helen’s Primary School received equal first prize at the 2009 awards and have now been allocated prestigious Peace Mala School status. Hafod Primary School was recognised for the impact the message of Peace Mala has on its building. A rainbow encircles the school on the outside and threads through all the rooms on the inside. St Helen’s Primary School was recognised for the way it welcomes children from many different countries who speak a range of different first languages. The third prize was awarded to St Joseph’s Catholic Infants School thanks to projects such as a DVD of an assembly devoted to the Peace Mala theme. The children of Clase Primary School received a highly commended certificate after creating and performing a rap version of Peace Mala. An entry from the Step-Ahead Education Centre in Cockett also won third place in the senior awards after each student designed and made a circular decal for a poster in a bracelet-like arrangement. Lord Mayor of Swansea Alan Lloyd, who is a former Hafod School pupil and chair of governors at St Helen’s, was at the ceremony in Cardiff. He said: “It’s wonderful to see many Swansea schools doing so well in such an important and major awards scheme as this. “Swansea is becoming an increasingly multi-cultural society so it’s vital our children grow up to become global citizens who have respect and tolerance for all faiths and customs. Cllr Mike Day, Swansea Council’s Cabinet Member for Education, said: “The world is becoming a far smaller place as each generation progresses to adulthood so it’s very important that the principles of global citizenship are instilled in our young people in this day and age.